When you’ve got a million things on your mind, it can be difficult to keep track of daily tasks or habits. I wanted to create a tracker where I could mark off tasks after I completed it. This helps me see when was the last time I completed tasks like clean the floors and wash the sheets, while it also helps me get closer to my goals. How? Let’s take losing weight for example. If that is your goal, you will need to introduce new habits into your every day life. Things like exercise and eating less unhealthy foods. 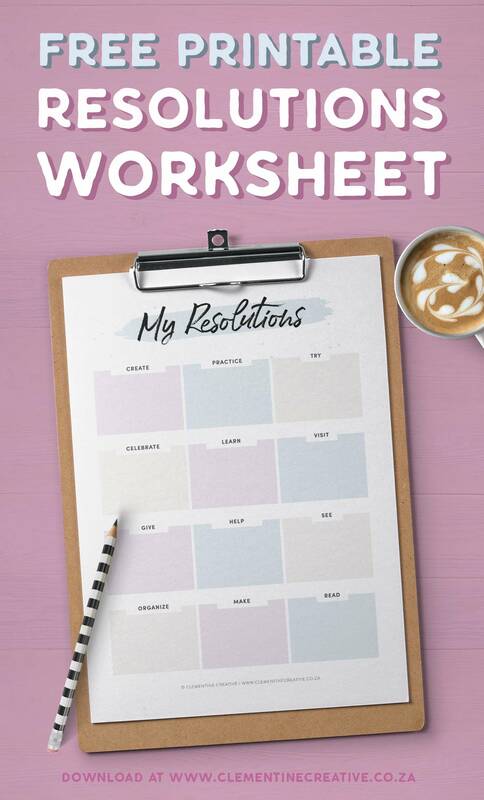 By using this free printable habit tracker it will hopefully help you to get in the habit (and out of the habit) of doing certain behaviours and reach your goals! This post contains affiliate links. I will earn a small commission if you purchase something through my links, at no additional cost to you. Read my full disclosure here. 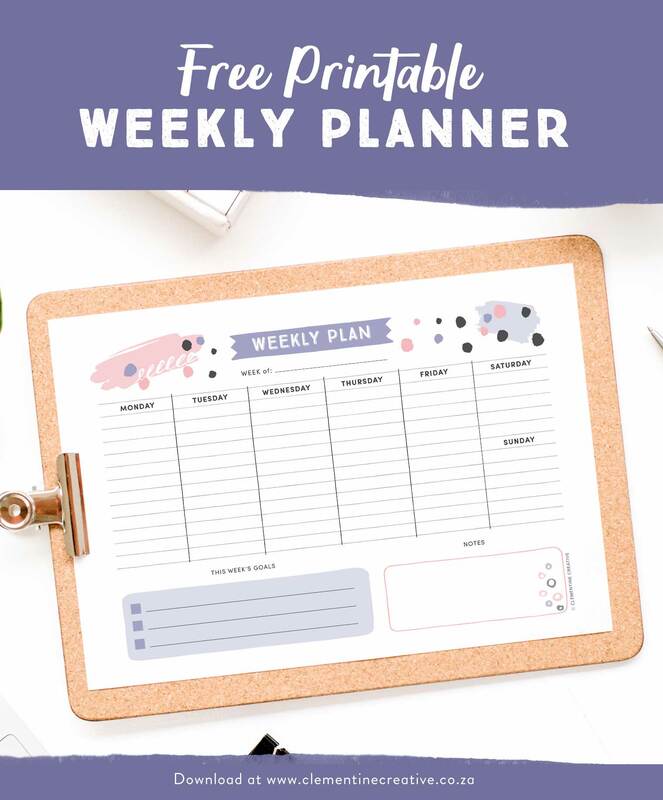 This page is a free sample of one of the 60+ pages of my new life planner kit that is available now! 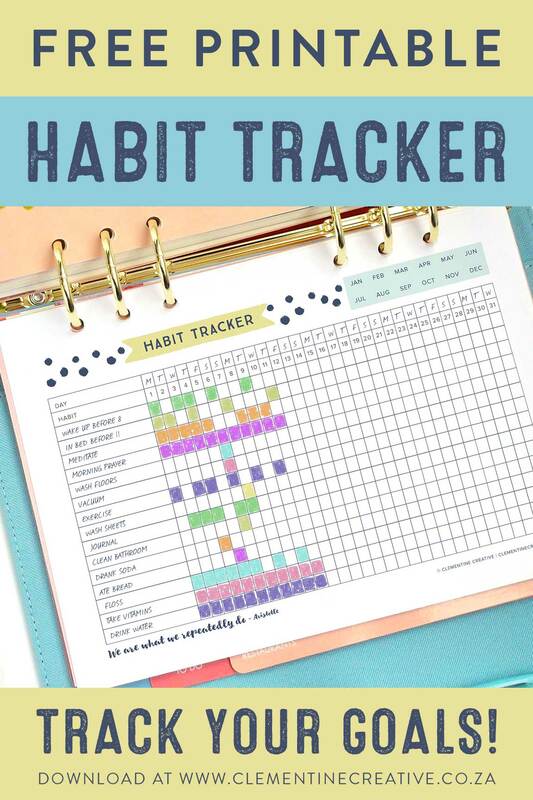 To download this habit tracker, please scroll down until you find the download links. 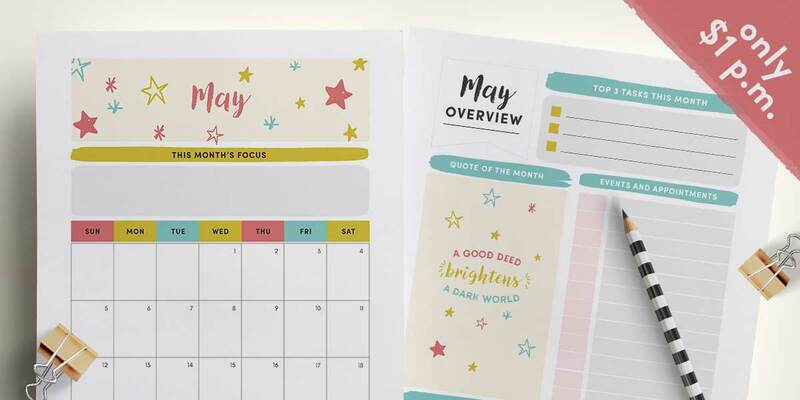 This printable habit tracker page comes in 3 sizes: US Letter (North America), A4 (Europe/International) and A5 (for planners like kikki.K large and Filofax A5). You can keep this sheet loose, or place it in a binder or planner. Pin the image below to save it to Pinterest! 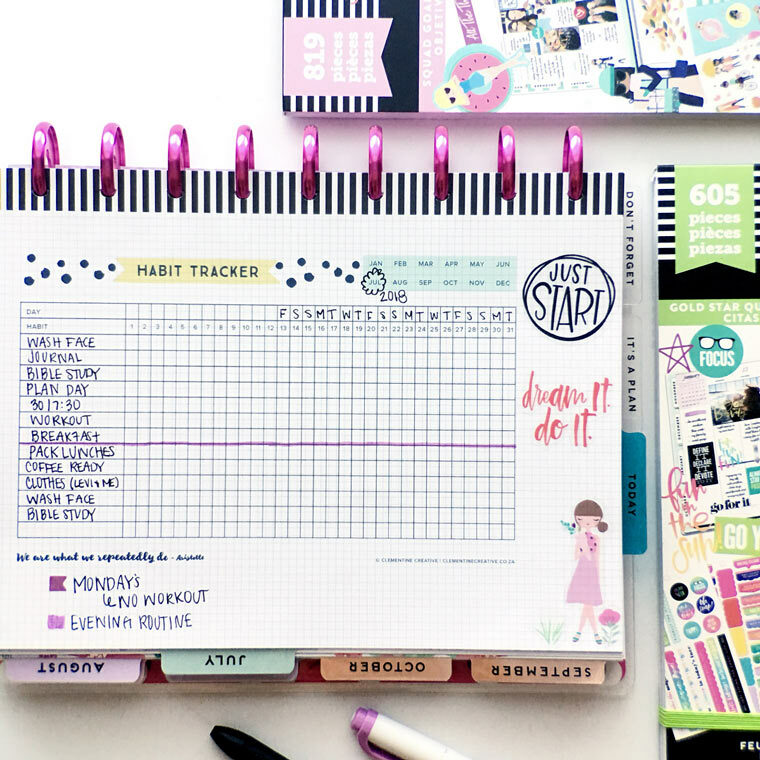 Ashley is using her habit tracker to track her journaling, Bible study, workouts, and more. She printed it a little smaller so that she could fit these cute stickers in the empty space. 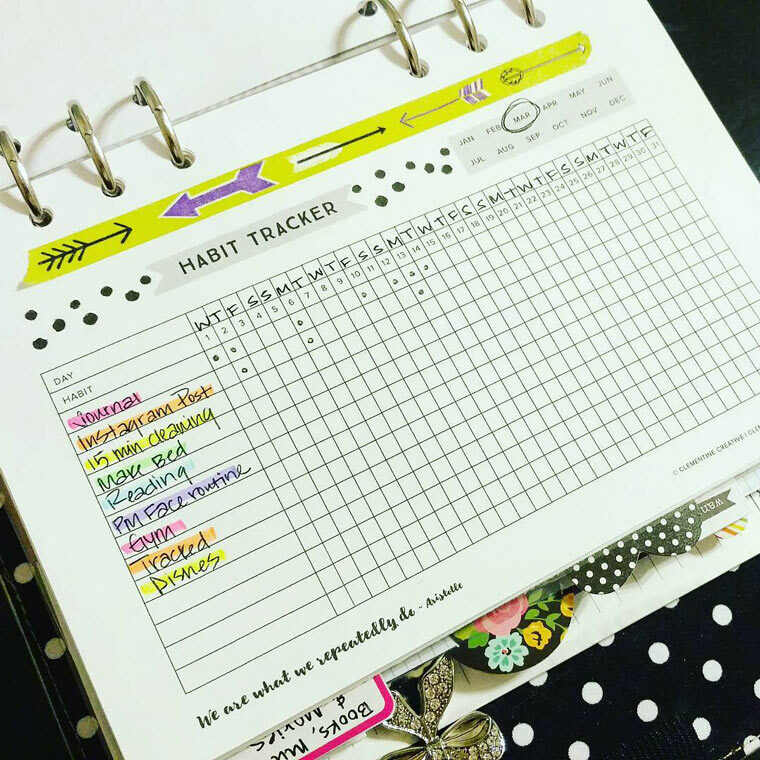 @planitbex is using her habit tracker to keep track of her fitness routine. 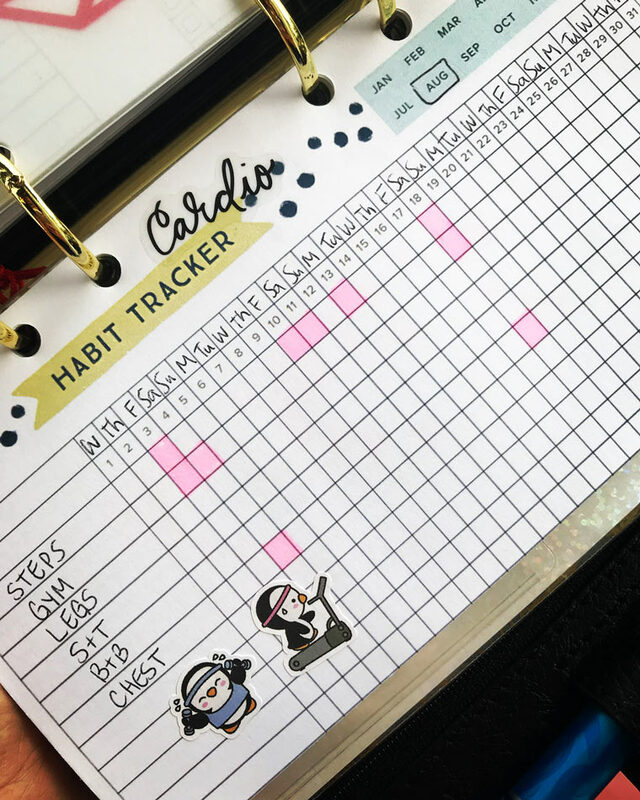 Lindsay is using her habit tracker to keep track of cleaning chores, gym, and more. Are you inspired to start tracking your habits? Let’s do this! Please note that all freebies on my site are for personal use only, and may not be sold, redistributed, copied, or altered. Thank you for respecting my terms. 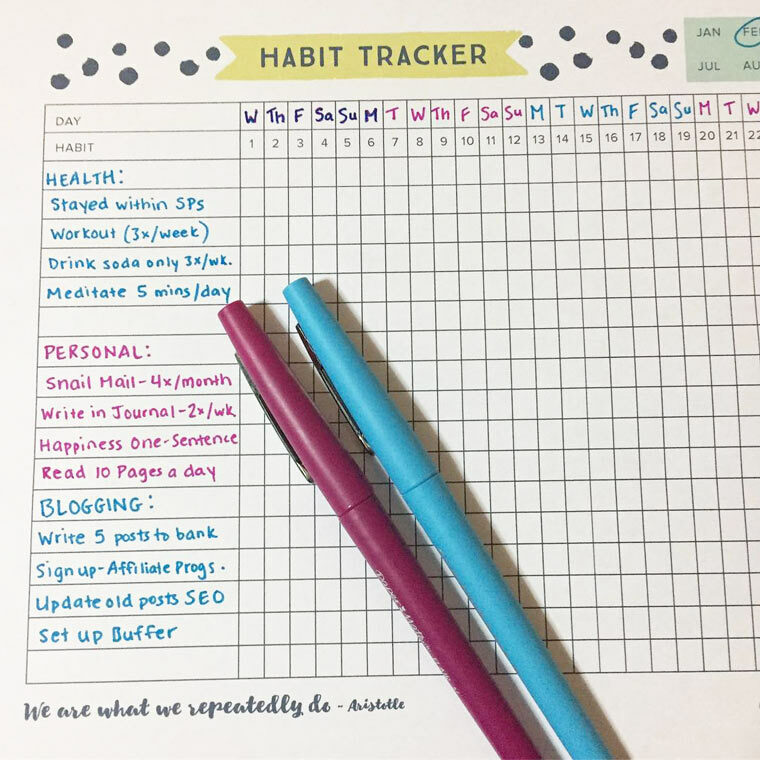 Need more ideas for using your habit tracker? 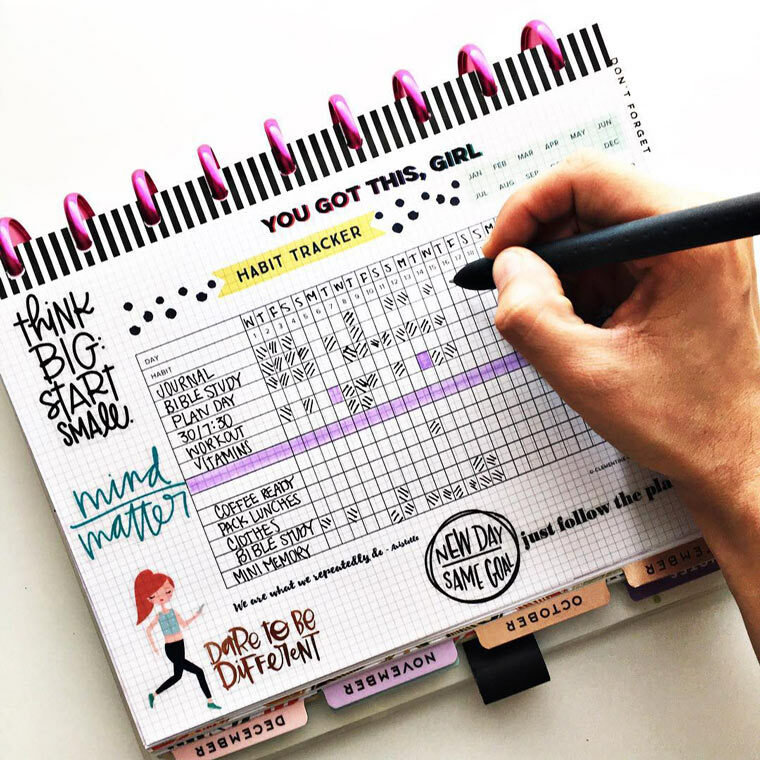 You can keep your habit tracker simple or dress it up like Ashley did. 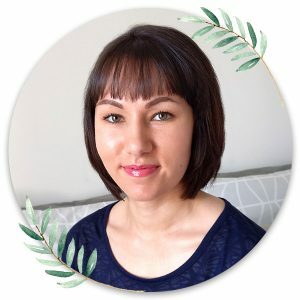 Divya split her tracker into three parts: health, personal and blogging. If you need more space you can use a different tracker for each area of your life you want to track. 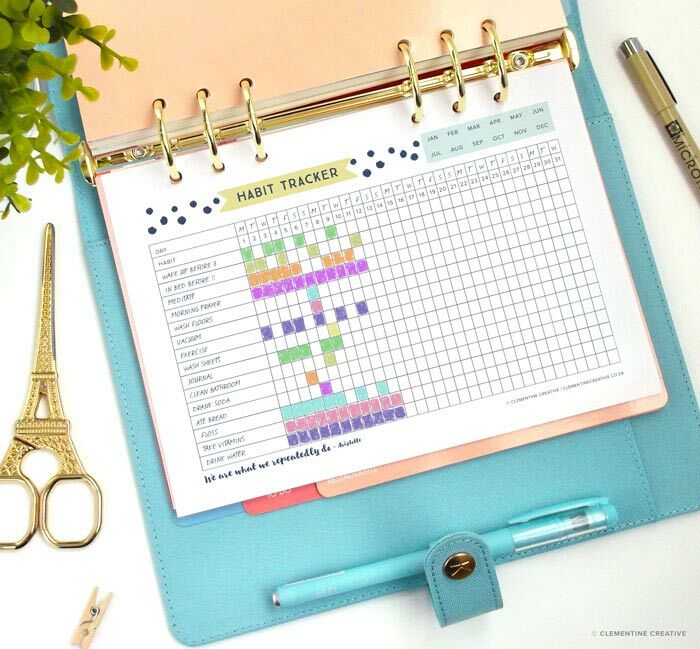 Do you need an editable habit tracker? Don’t want to write all your habits by hand every month? I feel you. That’s why I created a habit tracker with fillable fields where you can type in your habits every month, save the file and re-use it. This is exactly the same as the free version (the same sizes too), except you can fill in your own text on the PDF itself. It will save you more time so you can focus on cultivating those habits instead! 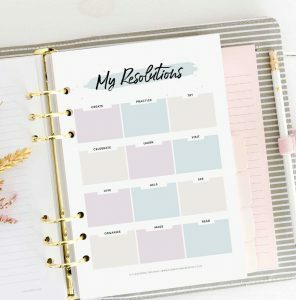 Inspiring accessories for your new habit tracker! Love this! 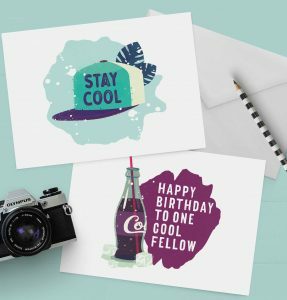 Thanks for your creativity and free printable! Aww thank you for your sweet comment, Krista! This is fantastic–and perfect timing. I just started yoga again and was looking for a habit tracker to help keep me incentivized. Thanks for making it not only cute but customizable! whatever they want to work on! Wow, what a great idea, Emilie! Love it! Thank you for this habit tracker! I cannot seem to print it – it gives me a message that I need to install a printer. I have a printer wirelessly connected already — any suggestions? Hi Jan, that sound very strange. I have never experienced a problem like that. Did you open the file in Adobe Reader? Sometimes other programs can give problems. Let me know if that works. Hi Alla, that’s a very good idea. I’m going to create an editable version that will be available to purchase soon. I’ll let you know! 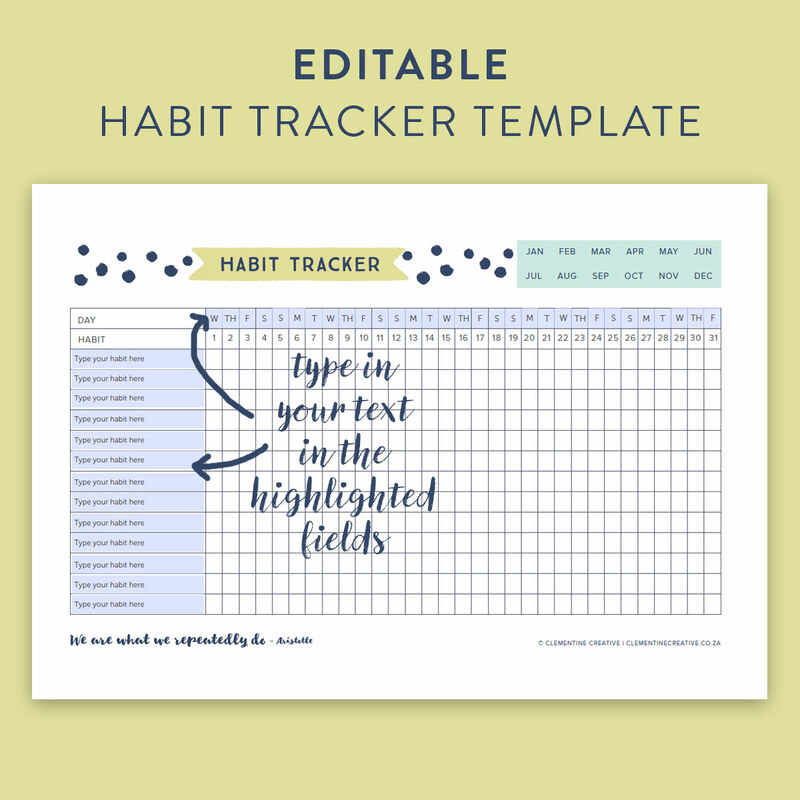 Hey Alla, the editable habit tracker is now available here! You can now type in your habits every month, save the file and re-use it. Thank you for your great suggestion! I love this printable! I have been looking for something just like this to hold me accountable. When I go to open it in photoshop, it asks for a password. Any suggestions? Hi Kate, glad to hear it is helpful to you! I prevent all of my printables from being opened and edited in graphics programs. This is to prevent others from stealing my artwork (which has happened in the past). If you would like to type in your habits instead of writing them, you can buy an editable version (to be opened in Adobe Reader) here 🙂 Let me know if you have any questions! I’m having to lose some weight and this Habit Tracker will help me very much! I plan to hike part of the AT next year. So glad to hear that it will help you on your weight loss journey! Good luck, Kim! Love it! Also, I love the binder in the pictures, do you remember where you got it?? Never mind, found it already 😉 But thanks again for the beautiful printable!! Hello Sanne, thank you! Yes it was from kikki.K. It was called the “cute” planner, but they don’t sell it anymore. What a great printable! I love it- thank you! Does this fit in the Erin Condren life planner? Hello Raqueese, the A5 size is 5.83 × 8.27 inches so yes, it will fit in the Erin Condren planner. It will just be a little smaller. Thank you so much for uploading these pdf sheets. It’s saved a lot of time and headache. Greatly appreciated! You’re welcome, Veronica! I noticed many people visit my website on a phone or tablet and can’t download zip files, so I started uploading PDFs instead. Oh boy. I have been contemplating my February goals for the past hour or so. And I realized goals are not what I need. Habits are what I need. So I got to work making a checklist for myself and then started googling it. This site was the first thing that popped up. I printed it out, popped in my “goals” or “habits,” and already put it on my fridge! I wanted to share your template on my blog post tomorrow. I will definitely link back to your site. Thank you so much for making this and sharing it for free <3 I'm so excited to have this visual to reference every night before I go to bed! Thanks for your awesome comment, Divya! You’re right. Sometimes we need to work on cultivating the habits first before achieving the goals. I’m happy to hear that this habit tracker will help you. I appreciate the share too! Great to hear that I could help, Wally! Do u have a tracker for diabetics to keep track of blood sugar levels and times. Keep track of what we eat too. Hey Kristen, I don’t have a tracker for diabetics, but I do have a food diary page in my Inspired Life Planner. Thank You, I was looking for one of these for my nephew and niece. Great to hear that, Mohammed! 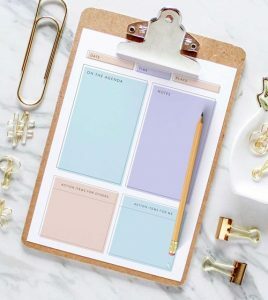 Does this habit tracker come in Personal Planner size? Hi Mary! It doesn’t but I’d be happy to include one. I’ll update it in the next few weeks. I tried to download these files but I got no luck with that. Hi Ali, glad you like them! The links are working 100% and download perfectly fine here on my side. Would you mind checking again? Trying a different browser might also work. This is beautiful. I’d love to know when it’s in Personal. Your products are great. Thanks for sharing your time and energy here! You’re welcome, Michelle! I’ll consider doing a Personal size too. Thank you for sharing your Habit Tracker, I can’t wait to see if it makes a difference in my commitments. Yay! Best of luck with your endeavours, Pamela! Thanks! I love this printable. I’ve been using it for several months to track my productivity at my office job. Hello, Carmia! Thank you for this great resource! 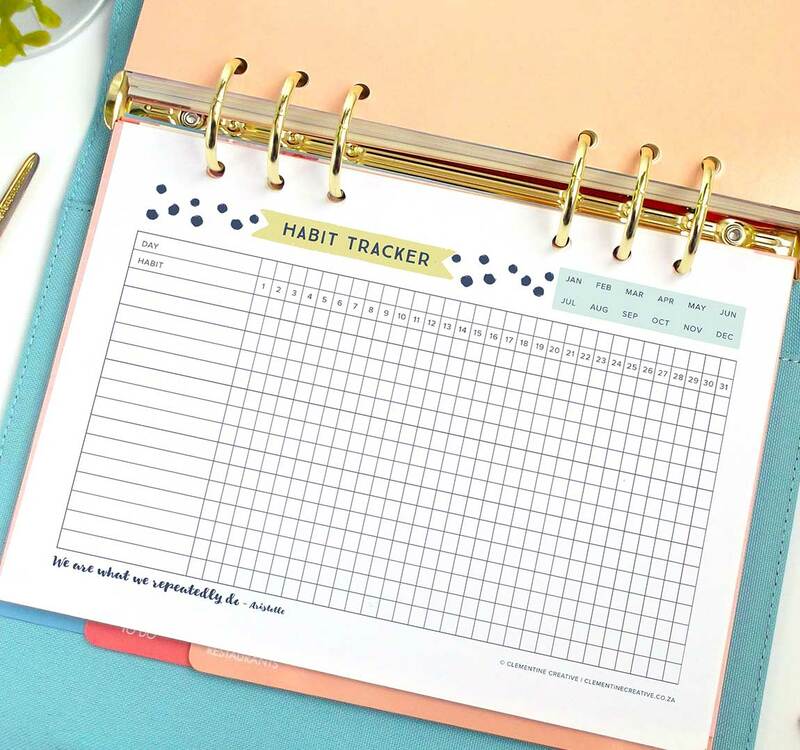 I just shared this with my followers on my blog and linked them back here so that they can visit your pretty site and print off their own habit tracker. Thanks again for this tool! If you live in the USA, you must use the US Letter size (8.5 x 11″). The A4 size is used in the rest of the world (Europe/Australia/Africa/Asia/South America). It is 8.3 x 11.7″. A5 is also used in the rest of the world and is 5.8 x 8.3″. please can you give me the sizes in inches of the habit tracker..I need to know if it fits the books I have to put them in..thank you for your help.. Thank you. I was having a conversation with myself just today about being accountable for tracking my meds and blood sugar readings and this popped up. The universe and you are helping me achieve my goals. This is perfect and so customizable. Thank you very much for the habit tracker! So easy to literary keep track of all the habits. Works a charm! Tell me, is it possible to somehow customize it? 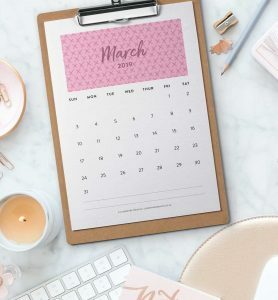 I mean if it possible to make the habit colum in the way that one could type in various habits and then save the file and then open and print it when a new months knocks on the door? Can you please make a habit tracker page for A6 size. Hi Barbra, I’ll try my best!